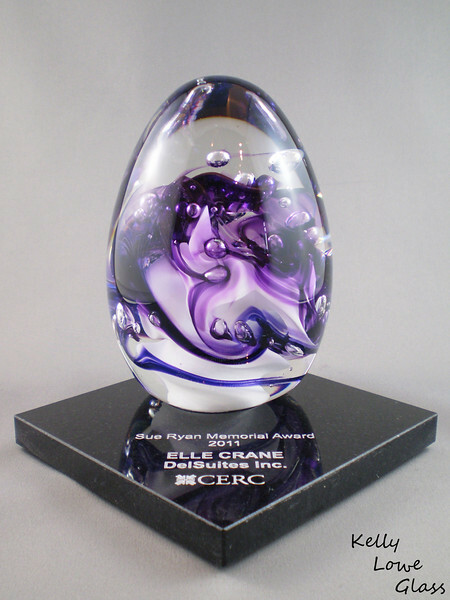 Custom Awards: In my thirteen years of designing and creating custom glass awards I've been honoured to witness my work being presented to influential politicians (up to and including our Prime Minister), our nation's top musicians and entertainers, as well as to leading contributors to science and medicine. I've also designed and created awards for many local companies and organizations, and feel just as honoured each time I am given this opportunity. It says something about a business, I think, choosing custom handcrafted work instead of generic, factory made awards. It shows more effort and care were put into the awards: that the event really matters to the people in charge. I'd also say it shows impeccably good taste (and I would assume they were a snappy dresser and probably smelled very nice), but any more than that and my bias would REALLY start to show. For more information on designing and ordering your own custom awards please visit my awards and commissions information page (link opens in a new window), or please enjoy some sample pictures of my work below.